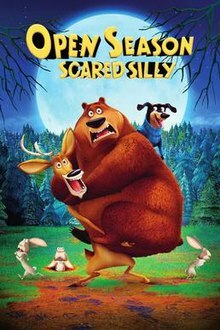 Open Season: Scared Silly is a 2015 American computer-animated comedy film produced by Sony Pictures Animation, with animation provided by Rainmaker Entertainment. It is the fourth and final installment in the Open Season film series, following Open Season (2006), Open Season 2 (2008), and Open Season 3 (2010). The film was directed by David Feiss and produced by John Bush, with music by Rupert Gregson-Williams and Dominic Lewis. With an exception of Melissa Sturm and Michelle Murdocca, none of the voice cast from the previous installments reprised their roles in this film. It theatrically premiered in Turkey on December 18, 2015, and was released as a direct-to-video in the United States and Canada on March 8, 2016. While the film acknowledges the events depicted in the original film, it ignores the continuity seen in Open Season 2 and Open Season 3, as characters, such as the Domesticated Dogs, Elliot's fawn, and Ursa, are completely absent in this movie. The film opens with Elliot telling a campfire story about the legend of the Wailing Wampus Werewolf that lives in Timberline National Forest. Domesticated Boog is terrified by the story and decides to "chicken out" of their annual summer camping trip until he knows the werewolf is gone. Determined to help Boog overcome his fears, Elliot, Mr. Weenie and their woodland friends band together to scare the fear out of Boog and uncover the mystery of the Wailing Wampus Werewolf. Also, Shaw, now a tour guide, witnesses an unseen creature in the forest and begs Gordy to allow open season and Shaw is determined to hunt down Boog and Elliot and catch the werewolf. To do so, he recruits his old friends Ed and Edna. Meanwhile, Elliot is heartbroken and catches the werewolf by himself alone after Boog angrily breaks up with him. A starving Mr. Weenie believes he is the werewolf. At Dead Bear Gulch, Elliot and Mr. Weenie are both caught by the werewolf with it reveals Shaw inside, but Boog and his friends leaped to the rescue. Shaw is defeated (in which he is revealed to be allergic to hornets) and arrested for impersonating a monster and creating a general panic, and open season is permanently shut down. In the end the werewolf turns out to be real, but Elliot befriends him by dancing with him as he joins their camp out. The next morning, Bobbie and Bob return to the R.V. and Bobbie tells Mr. Weenie that today is his birthday. Mr. Weenie says to the audience, "And so everybody did live happily ever after, including Mr. Weenie. The End". Before the credits roll, the werewolf wants Boog to become a werewolf lady one more time, but Boog refuses. Open Season: Scared Silly was first announced on June 11, 2015. The first trailer was released on November 1, 2015. The film was released on DVD and Blu-ray in the United States on March 8, 2016, by Sony Pictures Home Entertainment. Renee Schonfeld from Common Sense Media gave it a positive review, saying, "Talented voice actors, along with a clever story and script, make this very funny film a cut above most direct-to-DVD fare for kids and families". ^ "Open Season: Scared Silly". ^ a b "'Open Season: Scared Silly' Lands on Retail March 8". Animation World Network. February 19, 2016. Retrieved October 28, 2017. ^ "'Open Season: Scared Silly' Due for Spring 2016 Release". Rotoscopers. ^ "Trailer for 'Open Season: Scared Silly' Debuts". Rotoscopers. ^ "Open Season: Scared Silly". Box Office Mojo. Retrieved May 6, 2017.